After our trip to the Avondale Food Truck Rally, Dawn and I were hungry (literally) for more fun, so we made plans to tackle Chattanooga. She had been to a quirky little hot dog place called, Good Dog, and wanted me to check it out. I love a good hot dog, so I was excited about visiting this groovy little restaurant. We got up early enough so that we could get to Chattanooga by lunch time, keeping in mind that Chattanooga is an hour ahead of us. Good Dog is located on Frazier Avenue on the NorthShore, nestled in amongst an eclectic variety of boutiques and shops. It is a trendy and unique retail community. When we arrived at the restaurant, the first thing I noticed was the clever little bench on the sidewalk outside, directing me to, "sit, stay, eat". What else could I do? I didn't want to be sent to obedience school. We went in, placed our orders, found a seat and sat down. The decor was playful, with many references to the wonder of dogs, like why dogs are better than wives, etc. Each table was decorated with a different set of salt and pepper shakers. For example, our table had ladybugs. And one wall was lined with large lighted Christmas figures. I also noticed the holes in the tables, which made me happy. I knew what those were for, because Dawn had already filled me in. The holes are for the cones of french fries fried up fresh at Good Dog. You gotta love a place that thinks of putting french fry holes in the tables. We made our selections at the counter before selecting our table. Dawn chose a Chicago Dog with yellow mustard, sweet pickle relish, chopped onion, tomato, dill pickle, sport peppers, celery salt and poppy seeds. She also got a bowl of tomato basil soup. I opted for a chili cheese slaw dog with a side of frites (that's a fancy way to say fries) for us to share. What, you don't think we needed fries? We had a hole in our table we had to fill up! Geesh! Y'all are so judgy! I was also a little giddy about the sauces scattered around the room. Anyone who knows me, knows I love sauces. I am sort of the anti-Luanne in that respect. That's why we make a great team because she can always give me all her sauces. I snatched up squeeze bottles of French fry (Frites) sauce, wasabi ketchup and curry ketchup and put them on our table. I didn't want to go into this unprepared. I was also happy about the Dog Dust shaker I spied. Everyone wants Dog Dust on their fries, right? Appropriately armed, we were ready for our orders to arrive. First those delicious fries. And they fit in the hole perfectly. Don't they look yummy? Then our dogs. Mine is the one on the left and Dawn's is the one on the right. In the middle is her tomato basil soup with croutons. See those little green things on her dog? Well she asked me what they were and I said pickles, because that is what they looked like. She popped one in her mouth only to find out they were not pickles. They were hot peppers! I laughed so hard! I loved Good Dog! But our day wasn't over. We finished up our meal and decided to stroll around the neighborhood. We passed the Walnut Street Bridge, a beautiful old bridge transformed into a pedestrian bridge. I noticed a donut shop across the street that proclaimed to be the home of the Donut Sundae. That sounded sweet, but since we were full from hot dogs, we moseyed on. You just know if there is a bookstore around, I am going to find it. Winder Binder was way too cool not to investigate, so in we went. More than a bookstore, Winder Binder also has an eclectic assortment of art, vinyl records and t shirts. Ahhh! Another weakness! We found a store selling flavored olive oils. Olive Chattanooga has a wide variety of olive oils, vinegars and seasonings. Turns out the owner is from up around Valley Head or Mentone, so he was very familiar with our Alabama stomping grounds. One other thing I love about this neighborhood? Some creative genius decided it would be a good idea to put the moves to dances on the sidewalk. The sidewalk is littered with brass footsteps, numbered so that those who are so inclined can follow the numbers and learn the dances. Dances from the mambo to the tango are labeled and ready for any eager learners. When we concluded our walking tour of the NorthShore, we decided to drive over to the Bluff View Art District. We started our investigation of Bluff View with a visit to Rembrandt's Coffee House. We knew that Rembrandt's would be a great place to grab a cool drink and a sweet treat. Choosing which sweet treat would be the problem! The guy working the cash register was super helpful in this regard. When we told him we were thinking about getting one of the pretty macaroons on display in the dessert case, he quickly suggested the raspberry macaroon. Good call! That pretty pink macaroon was absolutely divine. Not too sweet, it was light, crunchy and full of fresh raspberry flavor. Next up? We walked to a great little bakery called, appropriately enough, Bluff View Art District Bakery. We each bought a loaf of freshly baked bread to bring home with us. The Bluff View Art District would not be an art district without art and Bluff View does not disappoint. In addition to the River Gallery, which features a wide variety of local, regional and national artists, and the Sculpture Garden overlooking the Tennessee River, pieces of art pop up in unexpected places throughout the district. After our stroll throughout Bluff View, Dawn and I decided to head downtown to Market Street to see what The Hot Chocolatier had to offer. If you are like Dawn and me, a trip to anywhere is not complete until you get your chocolate fix. The only problem at The Hot Chocolatier is deciding which chocolate to choose. I ended up with several truffles to add to the raspberry macaroon I bought earlier at Rembrandt's. My selection included dark chocolate salted caramel and a couple of other flavors that I have forgotten because I devoured them so quickly. Actually, I got two of each flavor so I could share with my husband. See, I'm thoughtful. We left Hot Chocolatier with our bags full of chocolate goodies and decided to head across the street. Why? Well, Hot Chocolatier is right across the street from The Chattanooga Choo Choo. No visit to Chattanooga is complete without a visit to the train of Glenn Miller's dreams. Today, the historic train station is a hotel offering standard rooms or rooms in former train cars. The property includes souvenir shops and eateries. We weren't hungry, but we could not resist peeping into the terminal's breakfast to dinner coffeehouse, Frothy Monkey. The yummy looking baked goods on display made us think Frothy Monkey would need to be on our agenda the next time we head to the River City. It was a great day. We always find new food adventures when we go off with our foodie friend, Dawn. She was, after all, the one I blame for telling me about Krispie Kreme's Hot Now sign. (How did I not know about that sign?) I can never ride by a Krispie Kreme without checking to see if the Hot Now sign is on. Thanks, Dawn! Nevertheless, we can't wait to find out what she plans for us next! 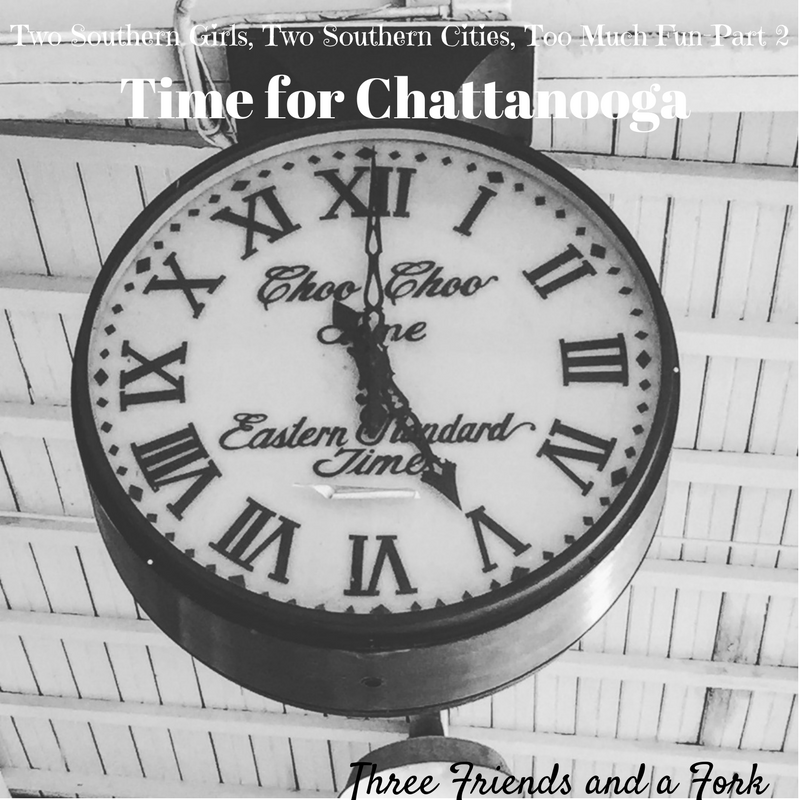 Three Friends and a Fork and our friend, Dawn, give Good Dog, Rembrandt's, Bluff View Bakery and Hot Chocolatier 3 Yummy Yum's UP! Choo! Choo!